One should ask the vital question, whether if Duraiappah was such a democrat who cared about the welfare of Tamil voters in Jaffna district and fairplay, why he couldn’t force his political mentors to hold the Kankesanthurai by-election in time, rather than abetting in the postponement of that election from October 1972 to February 1975? Duraiappah was indeed a ‘patriot’ for the Sinhalese, for the reason I mentioned in the first paragraph of this essay. But, majority of Eelam Tamils would never agree that he was a ‘leader’ of Tamils, like G.G. Ponnambalam Sr, S.J.V. Chelvanayakam, A. Amirthalingam or V. Prabhakaran. This is because, one criterion that separates Duraiappah from these four was that he was never cussed by the Sinhalese for his politics and bravura. Alfred Thambirajah Duraiappah (1926-1975) has become the Tunney Hunsaker (1930-2005) of Tamil history. Just for the same reason, Hunsaker (a journeyman pugilist) is remembered because he was the first opponent of boxing great Muhammad Ali (born 1942) to fall in 1960, Duraiappah’s name is remembered now, because he was the first military target of LTTE leader Prabhakaran. Colombo media is propagating the myth that Duraiappah was the savior of Tamils. But, Tamils with self respect and dignity look down on Duraiappah as a traitor and pimp for Sinhalese political interests. Personally, Duraiappah would have been an affable politico swimming against the Tamil nationalism current of his times (circa 1970-75). But, his deeds have not been forgotten. He was in the national limelight only during 1960-64, as the MP for Jaffna. In the early 1960s, many Tamils looked down on him, as an upstart. Last year, in the aftermath of the LTTE’s military defeat, the Colombo Daily News (May 26, 2009) belonging to the Lake House Group began a series of ‘Chronology of LTTE Terror’, with the Alfred Duraiappah murder (authored by Wijitha Nakkawita) as part 1. It is not as a joke that in Sri Lanka the journalism of Lake House is derisively tagged as ‘Fake House’. Even though, many Tamil journalists did contribute their sweat and blood to build up the Lake House, the real fact remains that ‘Fake House’ never championed the Tamil cause, even before the LTTE became a noted name in Sri Lanka's political lexicon. As such, it is my onus to present some details on the political career of Alfred Duraiappah, for balance. In this part 1, I introduce an unusual 8-page document, which appeared after Duraiappah’s assassination on July 27, 1975. After 35 years, it deserves preservation. 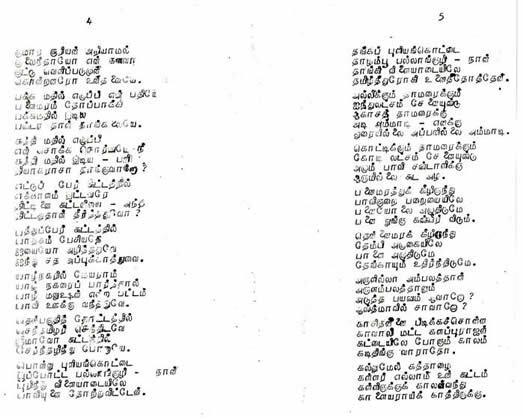 The original is in Tamil verse, which I provide as a scanned document in five frames. To the best of my ability, I have translated it into English, though I’m the first to admit that much of the poetic vigor and word play get dimmed in translation. The very name Duraiappah could be split as (Durai + Appah), with the meaning Durai=Lord and Appah = Lord. The word, Amma (literally, ‘mother’) can also mean a wailing cry ‘O’ My God’. Quite a number of tree names (palmyrah, coconut, lotus, water lily, tamarind, fragrant screw pine, kotti, Aloe, and othiya tree) of local flavor appear in the verse, replete with colorful idioms. Especially, othiya tree (Odina pinnata) in Tamil lore has the image as a tree of no use. According to Peter Percival’s Tamil-English dictionary, othiya tree is proverbially said of those who have a specious appearance, but are fit for nothing. Duraiappah’s deeds were satirized as that of othiya tree. 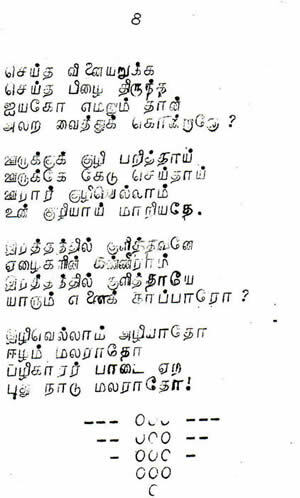 Oppari (wailing lament) is a folk music tradition, prevalent among Tamils. It is sung by women, when men die. Sadly, this music genre is in decline. 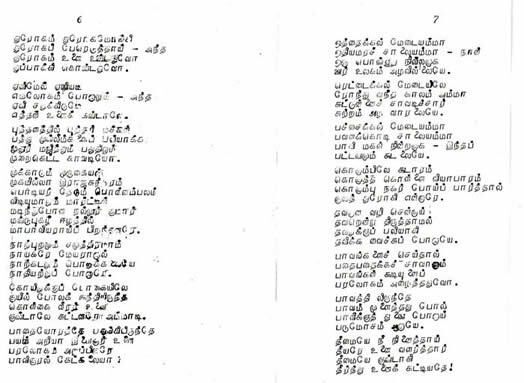 This document, composed in 1975, provides a derisive oppari, as sung by Dr (Mrs) Parames Duraiappah. Four specific lines in the verse make reference to pallanguli (a 14-hole board game played by Tamil girls and women) with the double entendre meaning as ‘I’ve lost you’ – a side reference to Alfred Duraiappah’s extra-political activity as a pimp for Sinhalese interests. To be fair, Mrs. Duraiappah was a respected personality of her times. She was a niece of G.G. Ponnambalam Sr. (1902-1977). 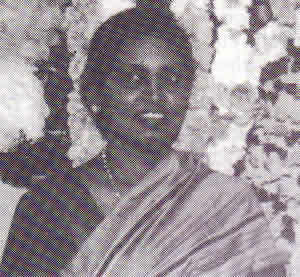 Being medically qualified, Mrs. Duraiappah quit the Sri Lankan health services (after working at Lady Ridgeway Hospital and Castle Street Maternity Home in Colombo and at Jaffna Hospital), and served at Brunei Government Medical Services from 1967 until her death on January 15, 1988. It is a fact that it was partly due to the social rapport earned by Mrs. Duraiappah as a physician (and as a niece of G.G. Ponnambalam Sr), that her wayward husband Alfred Duraiappah could cash in and squeak through as a victor in two general elections in Jaffna constituency against the formidable G.G. Ponnambalam Sr. in 1960. I have heard from my father, who served in Health Department clerical services in Colombo during 1960s, that stories circulating in the grapevine hinted about marital discord between Alfred Duraiappah and Parames Duraiappah, and that was a reason for the latter leaving for Brunei in 1967. Duraiappahs had a daughter Rochana (Esha), who married an accountant, David Begho in UK. 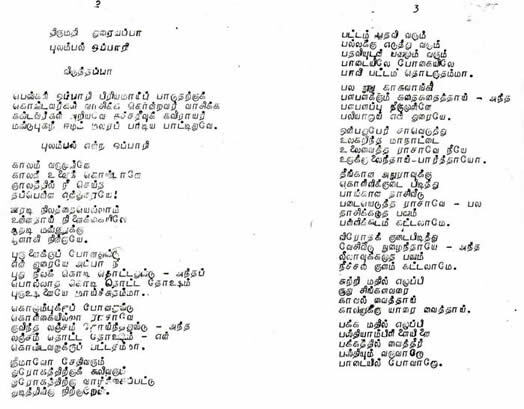 The wailing lament verse that I introduce here was on sale for 10 cents after Duraiappah’s assassination. 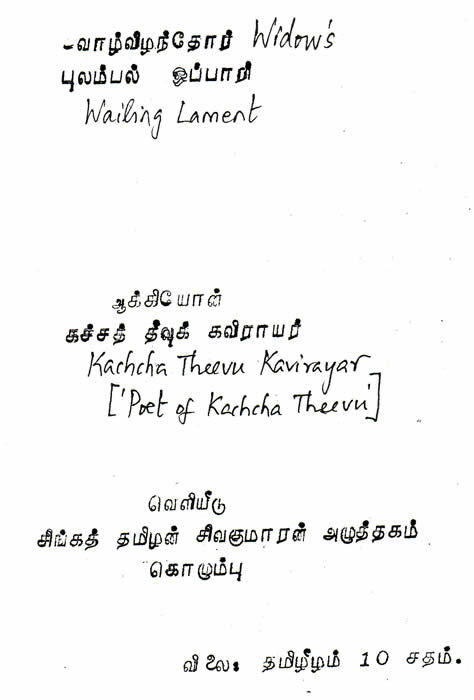 Unfortunately, the author was identified with a pseudonym, Kachcha Theevu Kavirayar (The poet of Kachcha Theevu). It was a period piece. It includes the names of Tamil politicians of early 1970s, who were identified as traitors to the Eelam campaign. Here is a list: C. Kumarasuriyar (a nondescript cabinet minister in Sirimavo Bandaranaike regime of 1970-77, who was an architect by profession), A. Thiyagarajah (the MP for Vaddukoddai, 1970-77, who defeated A. Amirthalingam in the 1970 election), C. Arulampalam (the MP for Nallur, 1970-77), P.R. Selvanayagam (the MP for Batticaloa, 1970-77), Murugaiya, Rajasundaram, V. Ponnambalam (the CP candidate who lost against S.J.V. Chelvanayakam in the 1975 by-election for Kankesanthurai), C.X. Martyn (the MP for Jaffna, 1970-77, who won on FP ticket and switched over to government ranks), Nallur Kumar, and police inspector Bastiampillai (who gained reputation as a torturer). Two Muslim politicians mentioned were Badiuddin Mahmud (an influential cabinet minister in Sirimavo Bandaranaike regime of 1970-77), and A.L. Abdul Majeed (MP for Mutur, 1970-77). Among the Sinhalese politicians mentioned were Sirimavo Bandaranaike (the prime minister during 1970-77) and her son Anura Bandaranaike (then crown prince!). Another featured name was Leela Narayanan, a dancer, who was ‘fixed’ for Anura’s sexual delight with Duraiappah serving as a pimp. This story was an open secret among Jaffna Tamils in 1970s. Two events that were remembered in this verse include the death of 9 Tamils at the 4th International Conference Seminar of Tamil Studies, held in Jaffna in January 10, 1974 and death of 10 Muslims at a Puttalam mosque due to police shooting in February 1976. What was your fault in this world – my Durai [Lord]! But why you fell within six feet pit? Had killed my husband – Amma. It’s me who married such a traitor is now left alone. You’d carry nothing but the sinner title. But before that polish dimmed, why did you fall my Durai [Lord]? You yourself had lost yours in turn. For the ill-minded Anura why did you pimp? Schools could be built from the funds of whoring trips! Swimming pool could be built in that sum passed to Leela! For guarding you – From Reaper’s strike who guarded you? By your side – will Basti travel with you? When will he board the hearse? Why did they kill you – before the secrets’ lid got pried? Side walls did collapse – even Banda couldn’t hold you. Surrounding walls did collapse – crazy Thiyagarajah couldn’t hold you. Why the rougish label got tagged for you sinner. Joining this Sirimavo group had got you. When I played it with meaning – I’ve lost you my sinner. When I played it with trust – I’ve lost you my Tamil traitor. For this weeping woman- there aren’t any nearby to cry with. The frond will cry and palmyra nut will shed tears. The frond will cry and coconut will shed off. Will he be the next to go? Or will he succumb to asthma? Will his time for hearse nears? Or when will it reach? The reaper waits for thieves in the guise of youths. Why you were devored by those treasons? Why a gun got you? Ladder may slip – when they see your image? Mutur Majeed and Badiuddin [Mahmud] fake phony tears. did give birth to these traitors. The four seas can’t wait – as he’d gone helpless. While on way to the temple – why you fell to the bullets? from heroes who sat like cuckoo – O’ My God! They sent you to Nether-land – this sinner’s lament unheard. a one woman wails – why the village and world ignores. They had shot you – but the kith fails to turn in. This sinner woman wails – this city doesn’t gather. Even in Colombo City – they sneered as Tamil traitor. Fell a victim for treason – and made me a widow. How did those sins embrace you – to Nether-world? Ills did turn as bullet –and clipped off your head. O’ the Lord of Hades – made you to scream and die? Why the pits of all who got hurt – turned into your pit? Bathing in the blood – aren’t there any to save me? All curse should vanish – when will Eelam bloom! When the sinners vanish – will a new nation bloom! Alfred Duraiappah's name now means many things for many. He was a traitor for the Tamil cause, and a fixer and a pimp of Sinhalese political interests. The arrogant claim by Rajan Hoole and coterie that “The nebulous and even vicious campaign against Duraiappah as a traitor was articulated by the TULF and there is strong circumstantial evidence of TULF instigation and acquiescence in the murder.” [Information Bulletin No. 24, University Teachers for Human Rights (Jaffna), dated Sept.7, 2000.] assumes that majority of the Eelam Tamils didn’t have brains to think on their own and that they don’t have an iota of dignity as Tamils. Political sycophants like Rajan Hoole may consider Duraiappa as their patron saint. One shouldn’t forget that there is strong circumstantial evidence for the SLFP-induced state terrorism and repression in Jaffna let loose by Duraiappah’s overt collusion with the state’s security apparatus. One should ask the vital question, whether if Duraiappah was such a democrat who cared about the welfare of Tamil voters in Jaffna district and fairplay, why he couldn’t force his political mentors to hold the Kankesanthurai by-election in time, rather than abetting in the postponement of that election from October 1972 to February 1975?